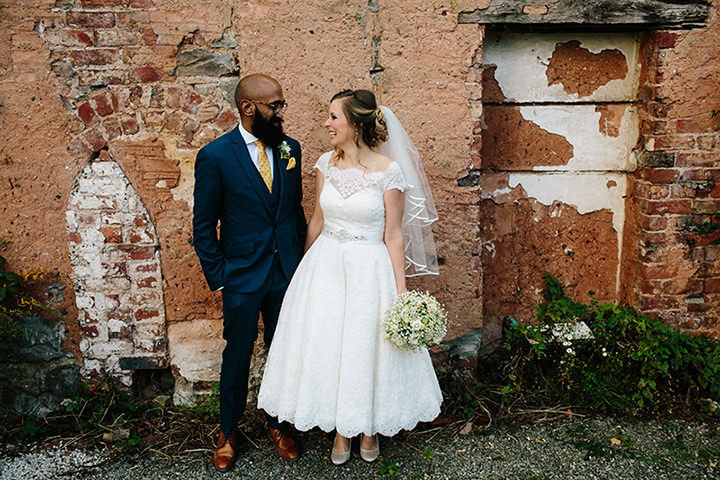 Today we have such a super cute wedding to share with you. 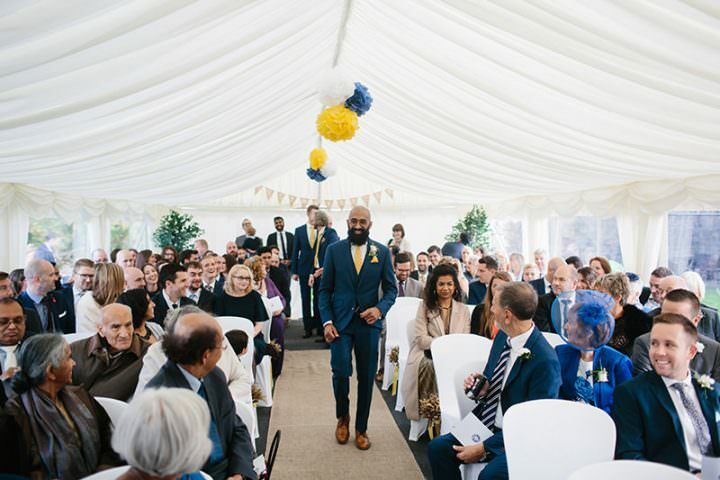 It’s a homemade wedding filled with so many lovely decoration ideas, along with a wonderful colour scheme of blue and yellow. 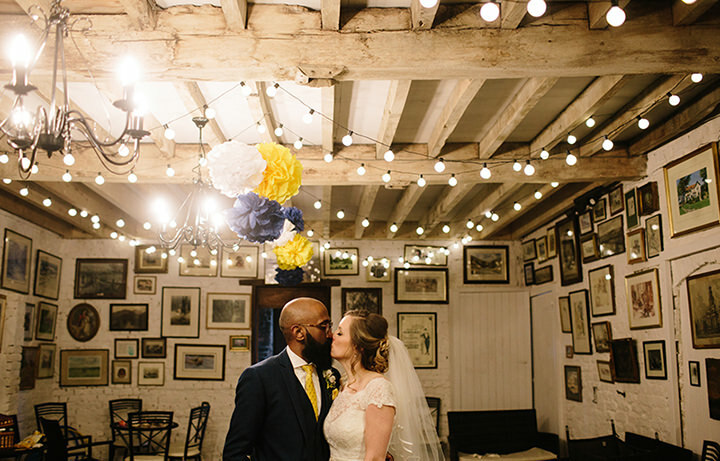 Emma and Sam chose a Dinosaurs and Daisy’s theme due to their love for both and kept the theme along with the blue and yellow colour scheme running throughout. 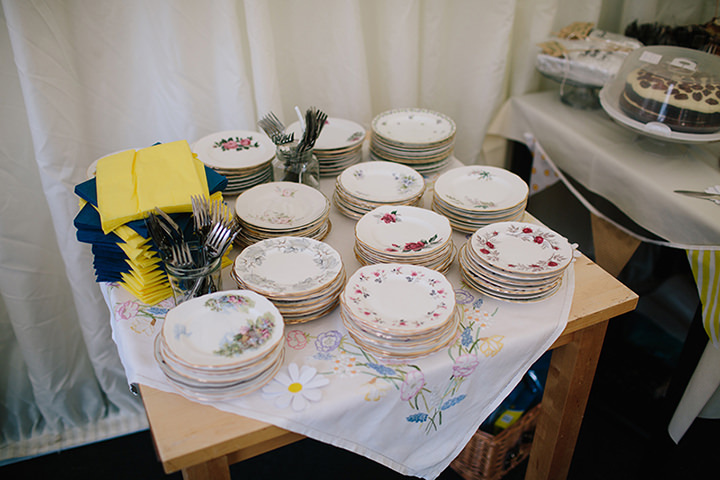 With an amazing cake table put together by the guests and the beautiful flowers put together by the bridal party, along with a whole host of other handmade details, this wedding really is an all hands on deck affair. 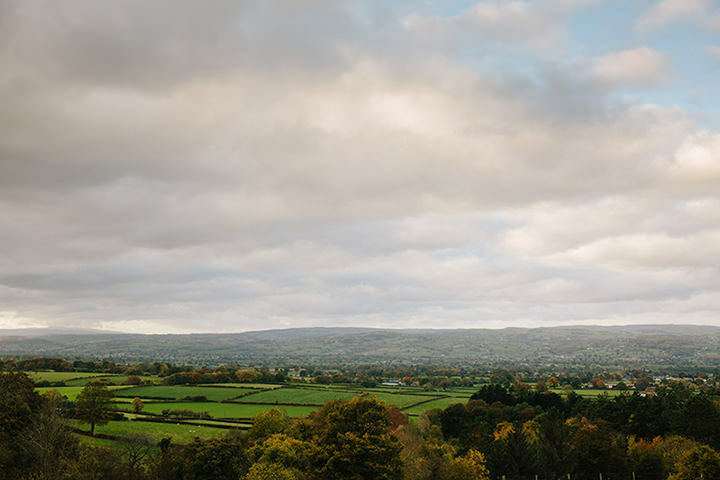 Big thanks to Dan Hough Photography for the lovely images. 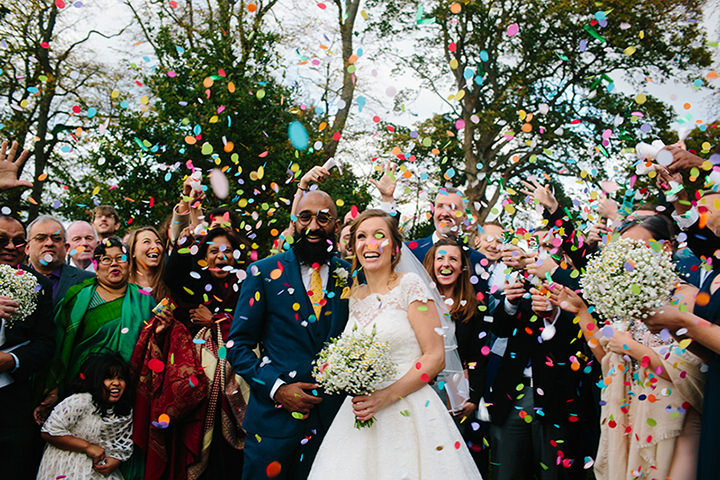 The rumours are true; it was absolutely the happiest, fun-est day of our lives. SO much fun; our faces ached from smiling, and our feet hurt from dancing. We met at work, and have been friends for years. 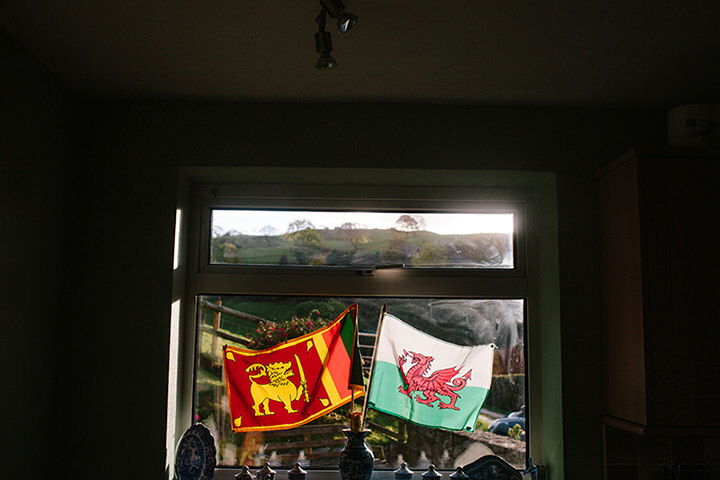 We got together after Sam moved in as a temporary lodger 7 years ago…. and he’s never moved out! 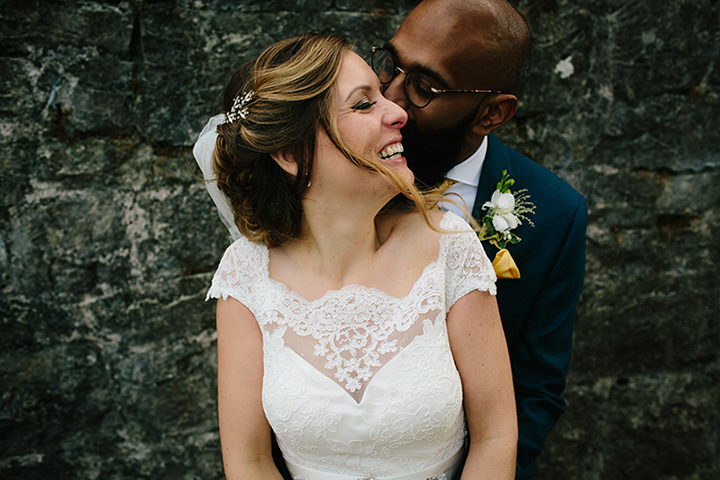 Sam: Emma LOVES Christmas; and in 2015 we were flying to Sri Lanka on Christmas Day, and although we were both really excited, I knew Emma would be a bit sad because it was her first Christmas away from her family. I decided to propose on Christmas Day morning before we flew to distract her from missing her family Christmas, but also so I didn’t have to carry the ring through airport security! Emma: to say it was a surprise would be an understatement. Sam planned the whole thing brilliantly; he chose a beautiful ring, created a beautiful ambiance (awesome breakfast with Elbow playing) and the timing was perfect. We still didn’t get an upgrade on our flight though! We had a spreadsheet and allocated costs to each area as a ballpark figure. 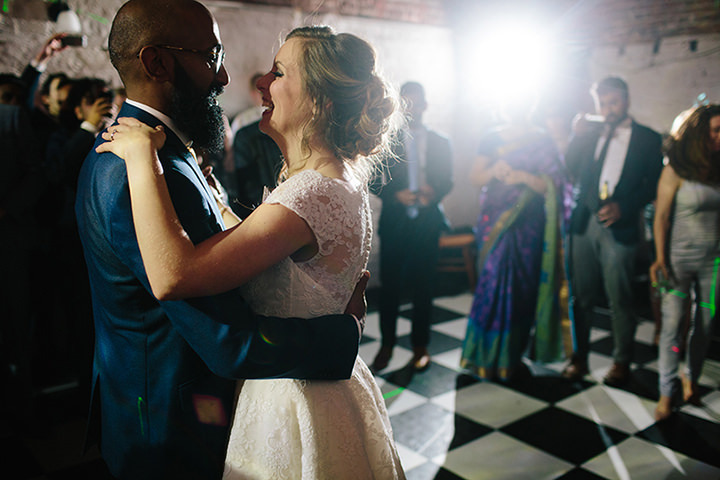 We initially wanted to have a budget-friendly wedding…but it quickly became clear that if we wanted to invite our nearest and dearest to celebrate with us, that wouldn’t be the case, and it meant more to us to have our favourite people around us than saving on the budget. We splurged on inviting as many of our family and friends as we could to celebrate with us. It was worth every penny. Our Bridesmaids’ dresses were from ASOS and reasonably priced. Sam’s 3 “Best Mandem” wore M&S suits, which were reduced in the summer sales. We only got the florist to do our bouquets. The bridesmaids and our mums did all flowers on tables and throughout the venue the day before, which saved us some money. 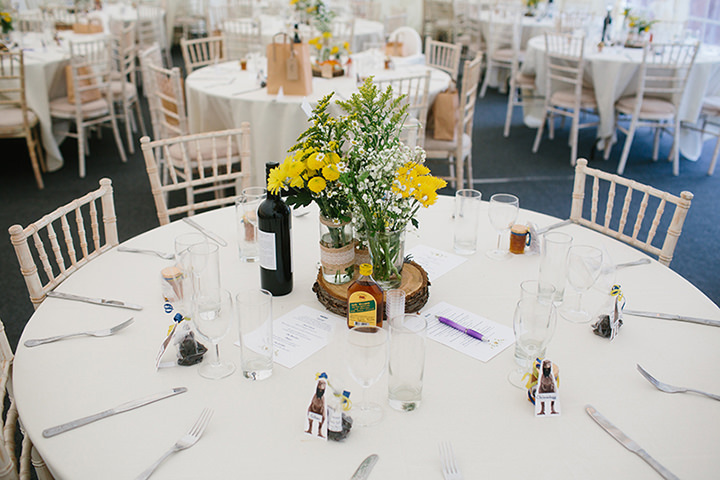 The flowers we had were very rustic and unstructured, and by getting them from a wholesaler we were able to have buckets of flowers around the place. Favours were made by the bride (treacle toffee, made to my Nain’s recipe) and our lovely Auntie Iman (who made 75 jars of “Imanmalade” for our guests to enjoy). Our venue allowed us to bring our own wine, so Emma had a road-trip to Calais with Sam’s dad to stock up on wine from Majestic, which saved us money. 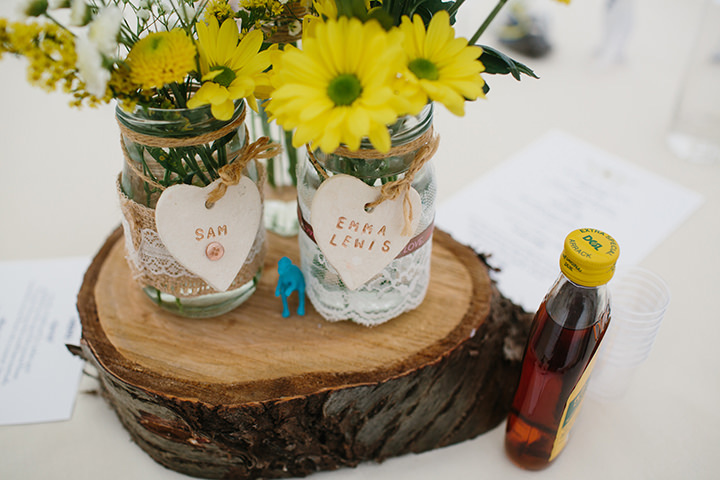 We then styled them up with fantastic personalised labels created by Sam and his friend (Gadgetboy). 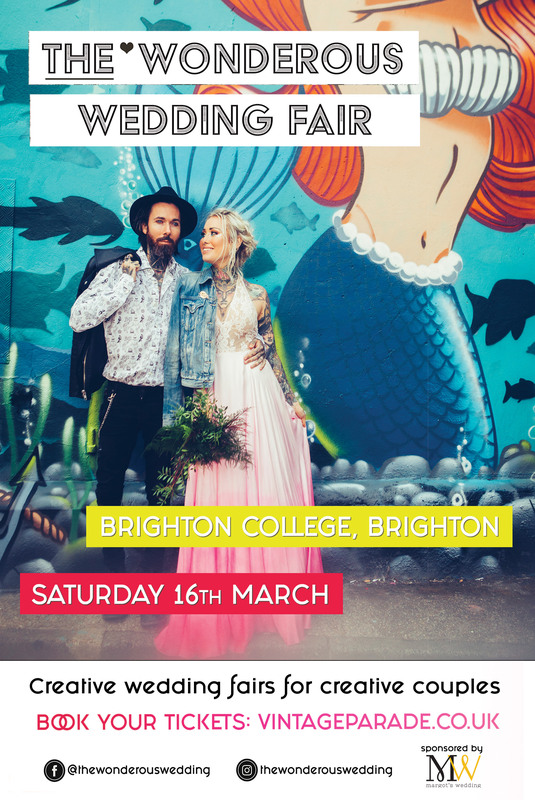 We met Dan Hough at a wedding fair quite early on in the planning. 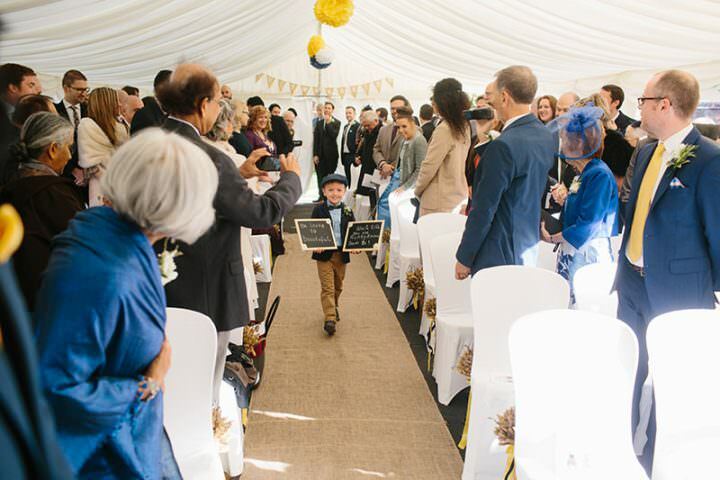 We were scared being at a wedding fair, but he was so friendly and laidback – we both could imagine working with him, and loved his work. He was a great choice. We had a fun engagement shoot a few months before which confirmed that Dan was not only a talented photographer. 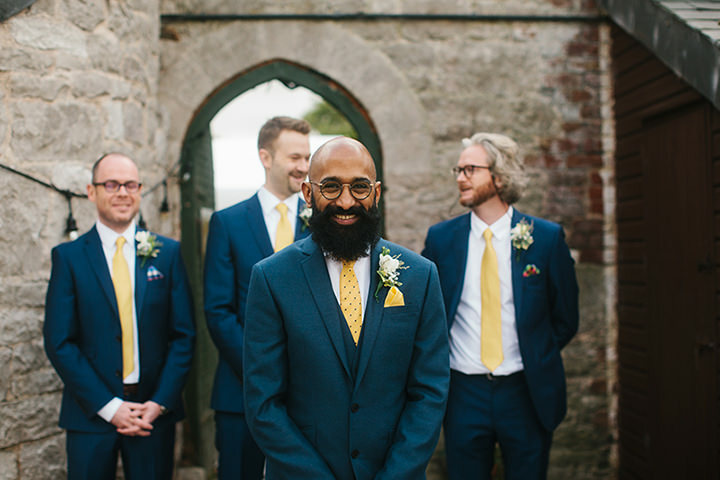 Dan is so laid back and captured some incredible moments on the day. My mum was endlessly patient during wedding dress shopping (thanks Mum!). 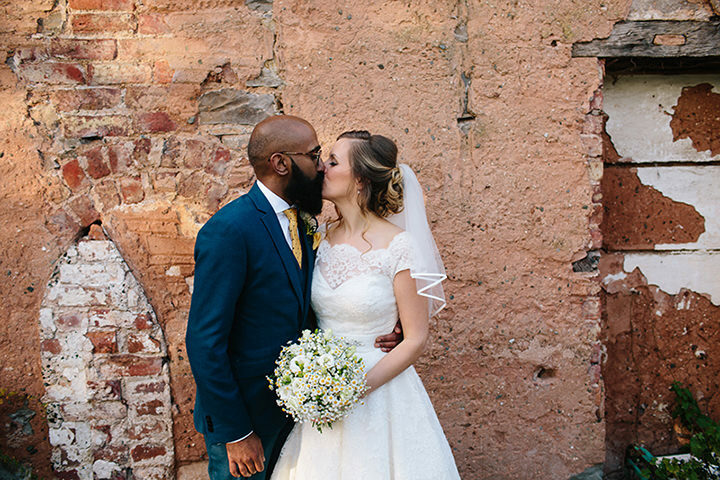 I had no idea what kind of wedding dress I wanted, so I tried LOADS on in lots of different styles. I had seen some tea-length dresses I liked the look of on Pinterest, so narrowed my search to these – as I felt most like “me” in a dress I could walk, dance and twirl around in! I settled on a beautiful LouLou Florrie which I added a couple of inches to, to make it ballerina length. 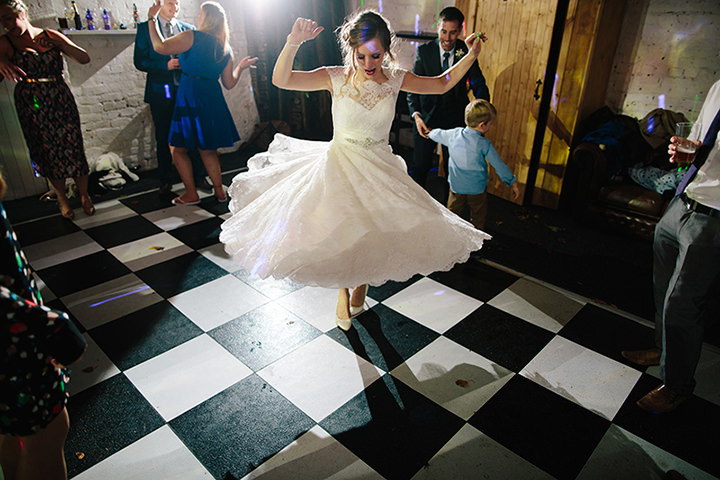 The length of the dress felt very “me” and I couldn’t stop twirling in it! All were from Artistocrats of Chester, who were fantastic. I had two pairs of shoes; ivory pumps from Rainbow for the day, and electric blue heels for the night-time. 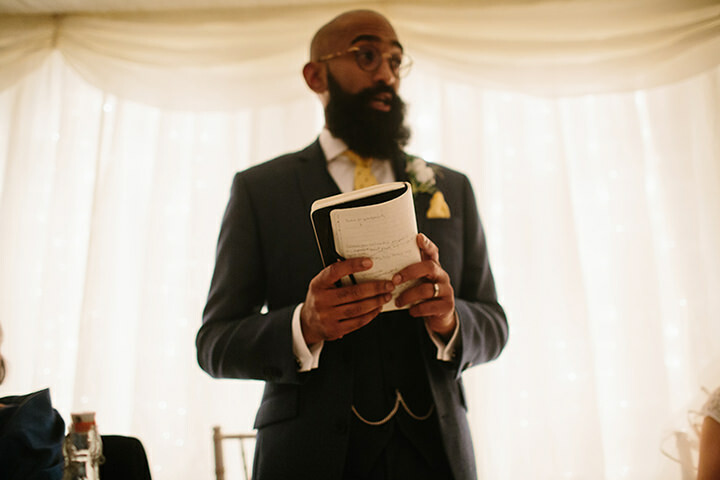 Sam’s 3-piece suit was Kenneth Cole from House of Fraser and found pretty easily. It was a beautiful soft and comfortable fabric, and he looked incredibly dapper. 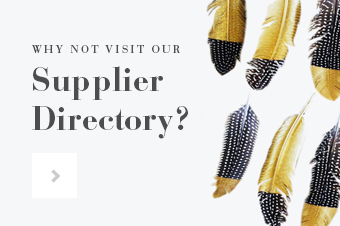 He then spent ages looking for a pair of shoes before falling in love with a pair of Loake tan brogues from… the same House of Fraser he bought his suit a few months earlier. 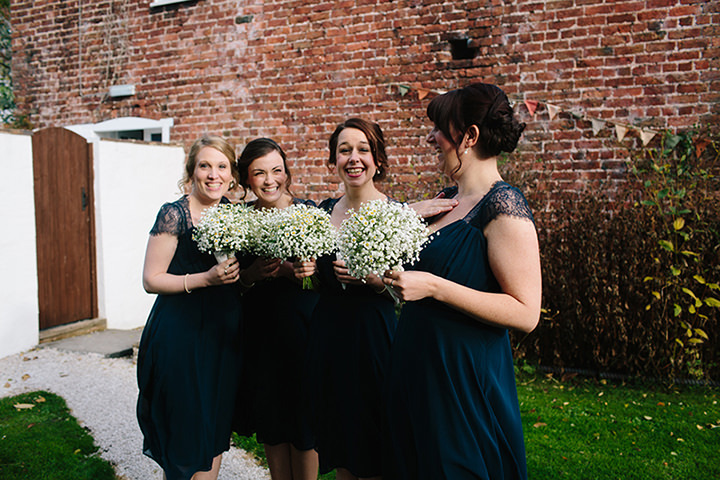 My brilliant bridesmaids looked beautiful, four matching in ASOS navy below-the-knee dresses which had a lace back; linking in with my dress (a happy accident). 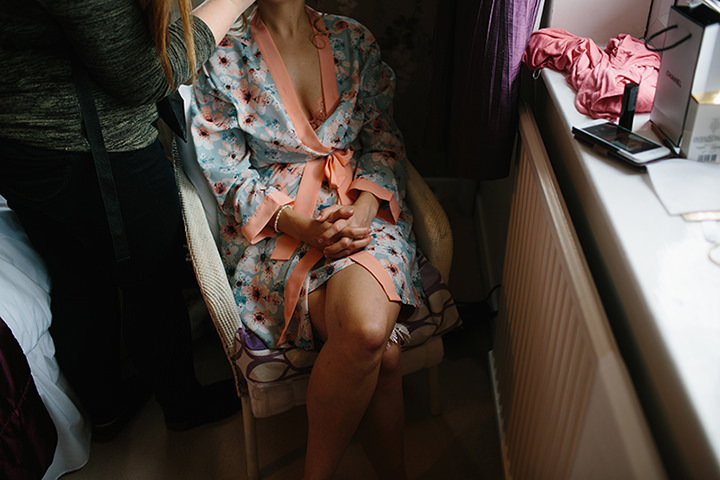 Was so convenient getting the dresses from ASOS, especially when one bridesmaid had to order one in the maternity version upon realising she’d be 7 months pregnant on the wedding day! I had seen some yellow & blue colour schemes on Pinterest which I liked the look of, and we kind of went with that. We ended up having a “Dino-Daisy” theme to the wedding which ran through flowers, decorations and other elements of the day (including Sam’s entrance to the Jurassic Park theme tune). 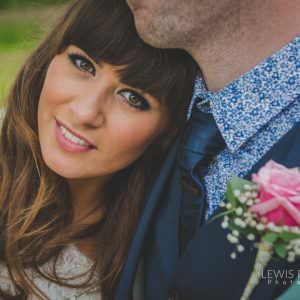 My friend Ellie runs a fantastic wedding planning and styling business. 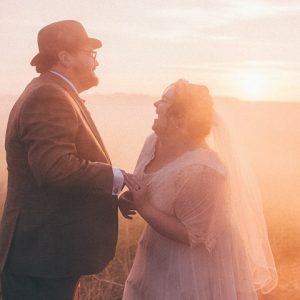 She helped me identify that my theme was “rustic” from the garbled explanations I gave her, and was able to point me in the direction of things which would help make my random thoughts and visions of the day into a reality. 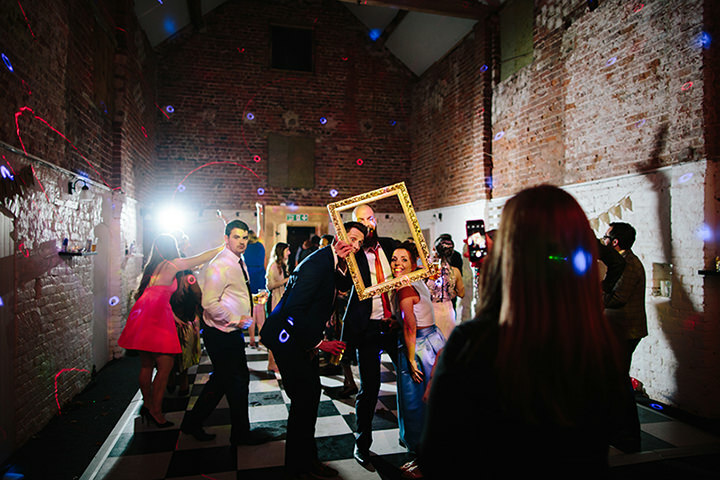 We had a fantastic blank-canvas venue – and Ellie had brilliant insight into how to make each space work, and a huge variety of props for me to hire which made a real impact on the day. Sam’s nickname for me is Daisy, so we knew they’d have to feature heavily! We knew this might be a struggle in November. Luckily both our florist and the wholesaler were able to get hold of enough. Sam enjoys cycling and T.Rex; so these featured highly on the day! We had dinosaur place-names. 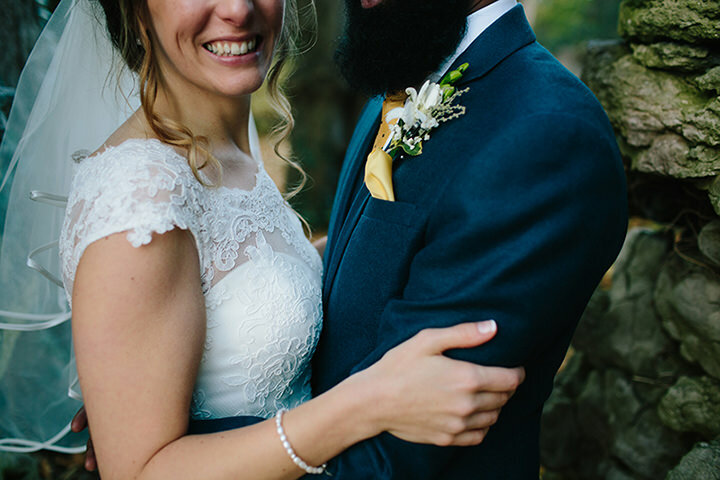 Our friend Ana hand-crafted some beautiful bike-chain buttonholes and cufflinks for the groom and best men. 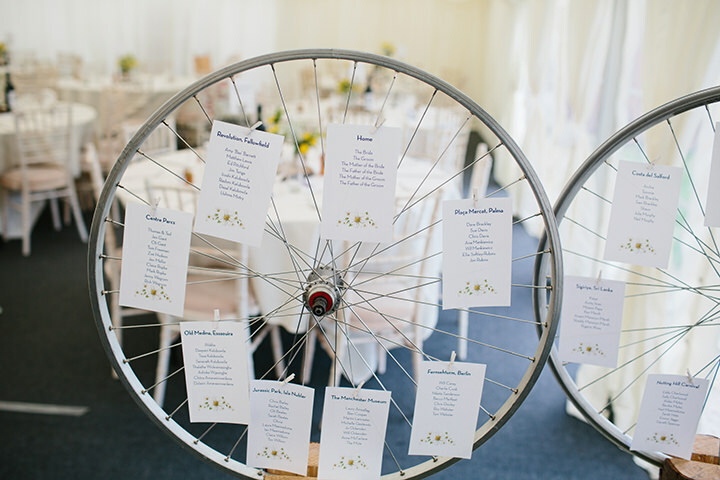 Emma’s dad is a builder, so when we presented him with two bike wheels, he crafted them into amazing stands for us to display the table names on, and a few days before the wedding he made us an incredible personalized rustic photo-frame; which we decorated with “DinoDaisy bunting” leftover from Emma’s hen do. 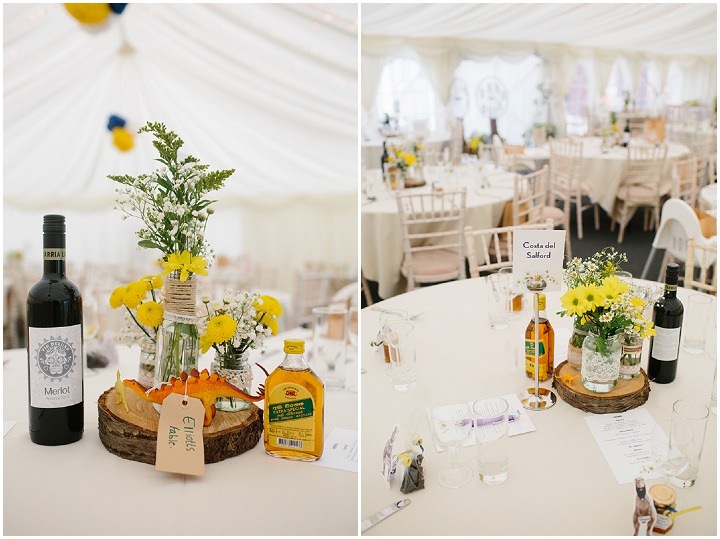 Sam’s mum and aunt spent a lot of time preparing wheat sheaves spiked with fragrant lavender for the ceremony room, which looked amazing. Ellie gave Emma a tutorial in making tissue paper pom-poms, and Emma made 45 in yellow and blue. 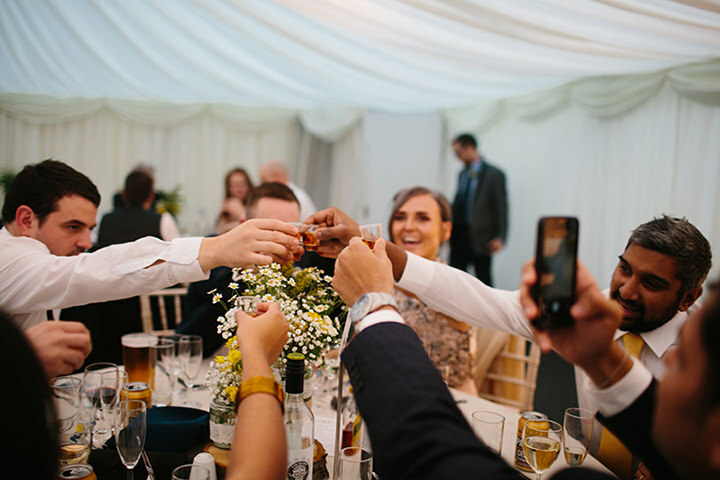 We found fantastic caterers – Dinner by Design, who were really flexible and responsive to our whims; We had Sri Lankan canapés hand-made by Sam’s parents and for our main meal – we had delicious BBQ pulled pork with BBQ beans and potato wedges and salad. Dessert was cakes from the cake table which was more a ‘wall of cakes’ than a table. 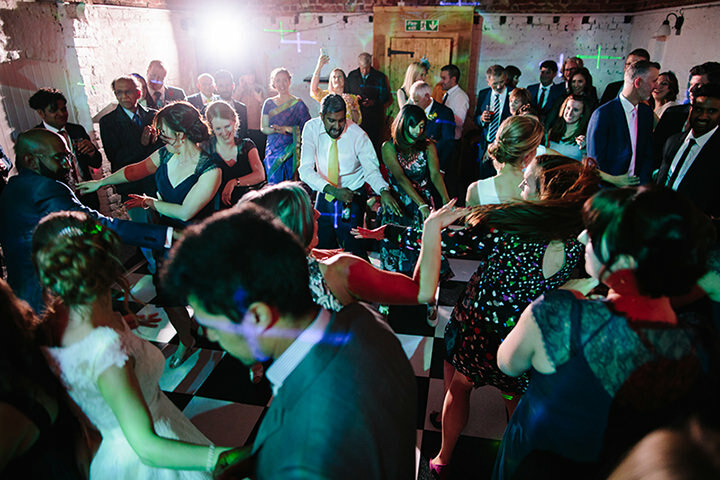 In the evening a pizza oven arrived to keep revellers fed into the night, as well as cheeseboard stocked with local cheeses…and more cake! We saved by not having wedding cake; instead, we asked our guests to get their bake on as a gift to us. 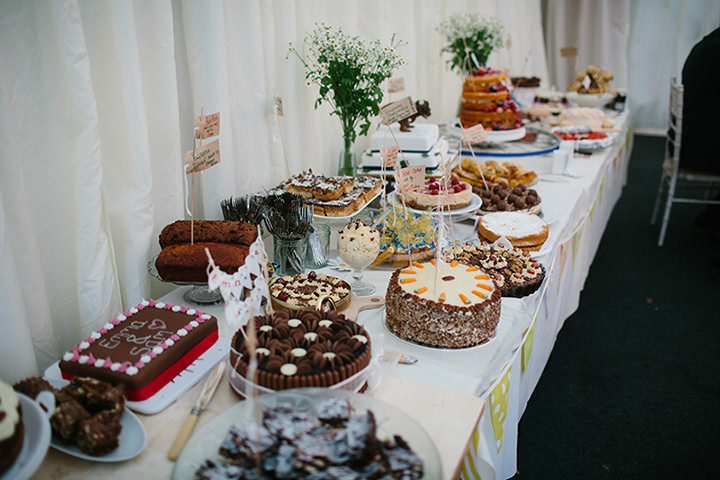 Our cake table was heaving with delicious treats baked with love by our very talented friends, and it meant SO much. 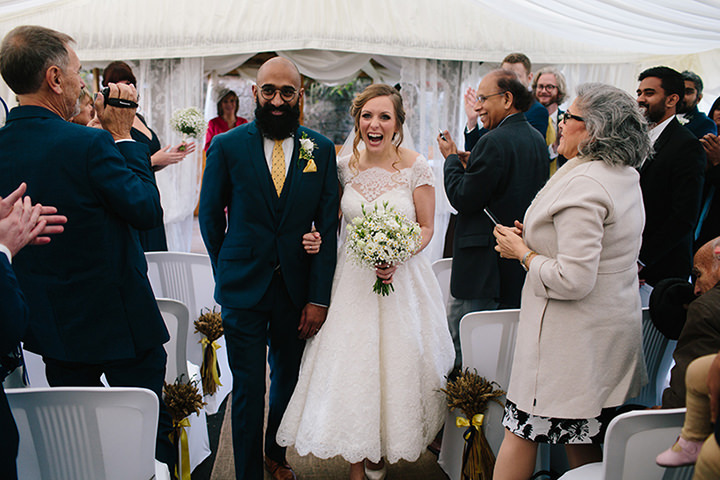 The mother-of-the groom bought two, including delicious Sri Lankan wedding cake and another topped with 2 T.Rex, and Emma’s mum made an incredible 4-tiered naked cake, which she and Emma’s aunt assembled and decorated on the morning of the wedding. Emma’s parents very kindly arranged for a Welsh male voice choir to sing after the ceremony; and they went down a storm – with a mix of traditional Welsh folk songs. Singing along with my Dad to some of these songs was one of the highlights of my day. 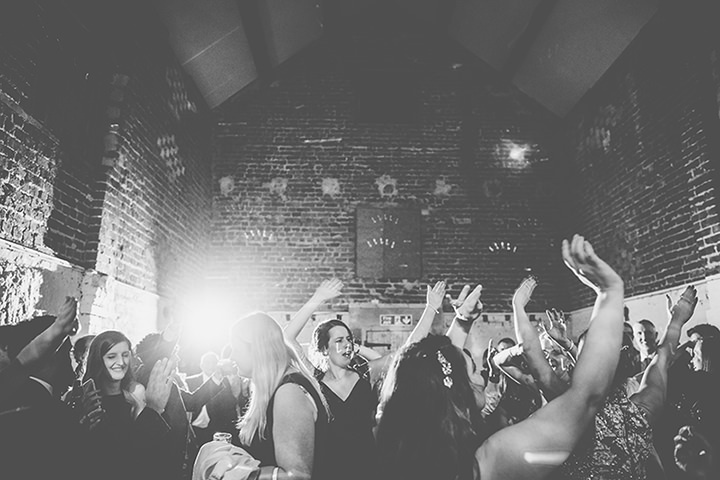 We had a disco in the evening, and knew our friends would keep the dancefloor full all night. 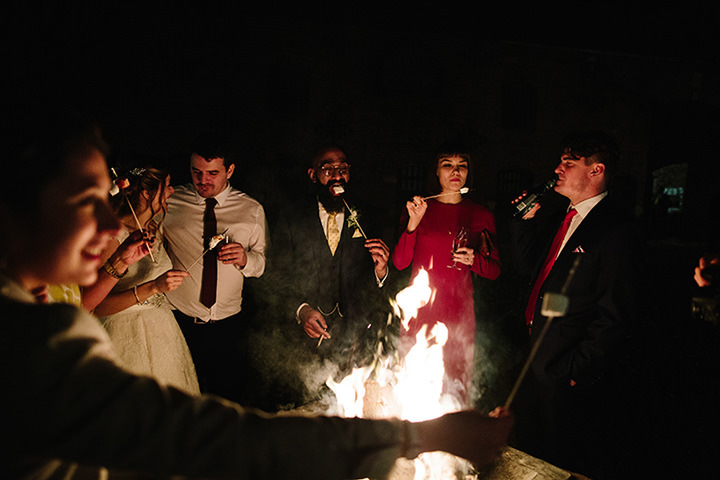 We also had a huge bonfire, incredible fireworks and firepits with marshmallows for toasting. 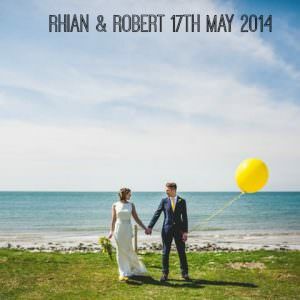 Another area we saved money with is not sending save-the-date cards and sent an email instead. 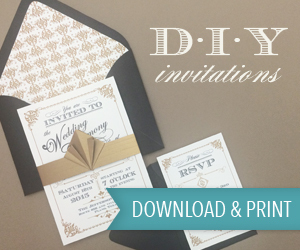 We asked our talented and fabulous cousins, Thushan and Meg to design our invitations. They created personalised T-rexs taken from original Jurassic Park concept sketches and created some amazing invitations! Then a few weeks before the wedding, our friend Gadgetboy again helped us design wine labels, quizzes, orders of service and table plans. Seriously, our friends are amazing! So many! 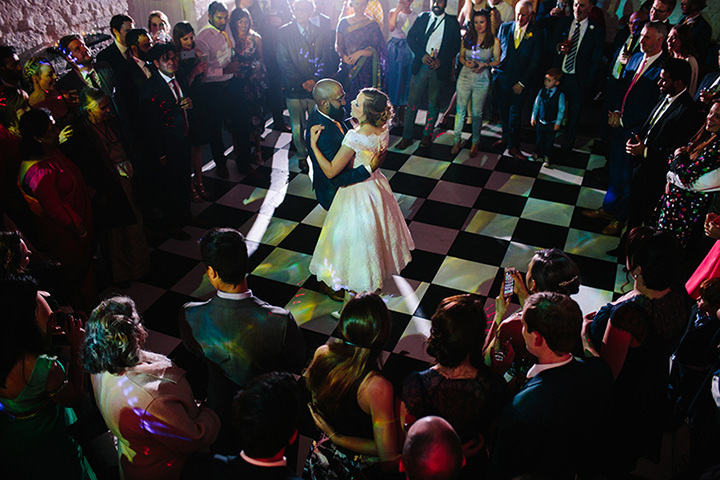 The whole day came together with a lot of personal touches which meant something to us both. Children had goodie bags (dinosaur themed, obviously!) on their tables to keep them distracted/entertained. 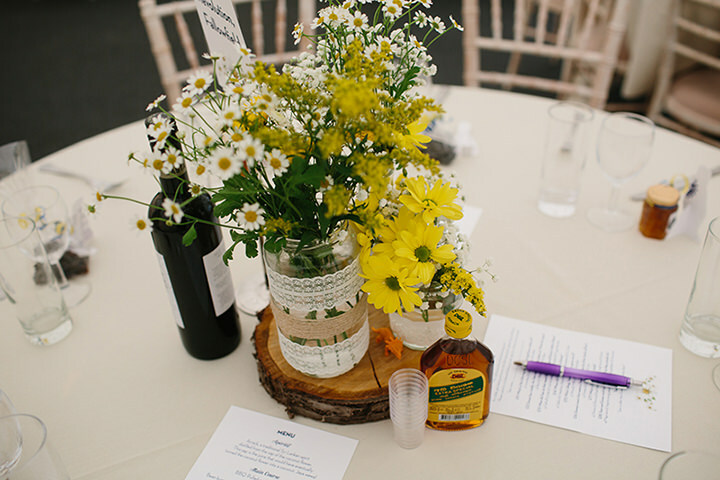 We had bottles of arrack, a Sri Lankan spirit made from coconut sap on the tables to have shots, and a quiz to get guests chatting to each other. Sadly none of our grandparents could be there on the day – but their photographs were proudly displayed on our card table. We also had other touches of them around us. These touches meant we could feel close to them despite the sadness of their absence. 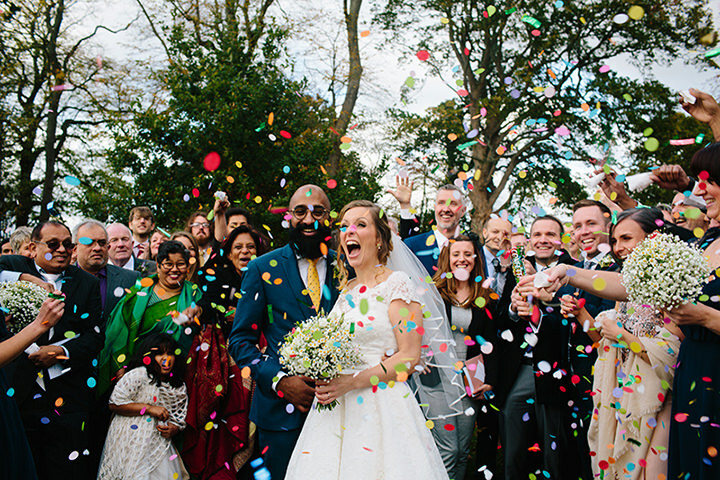 Our nephews did brilliantly on the day – with various jobs including distributing confetti! Our friends who did readings did a fantastic job, but special shout-out to Jen Mellor, our fabulously-talented writer friend who wrote us our very own piece which Emma heard for the first time on the day. 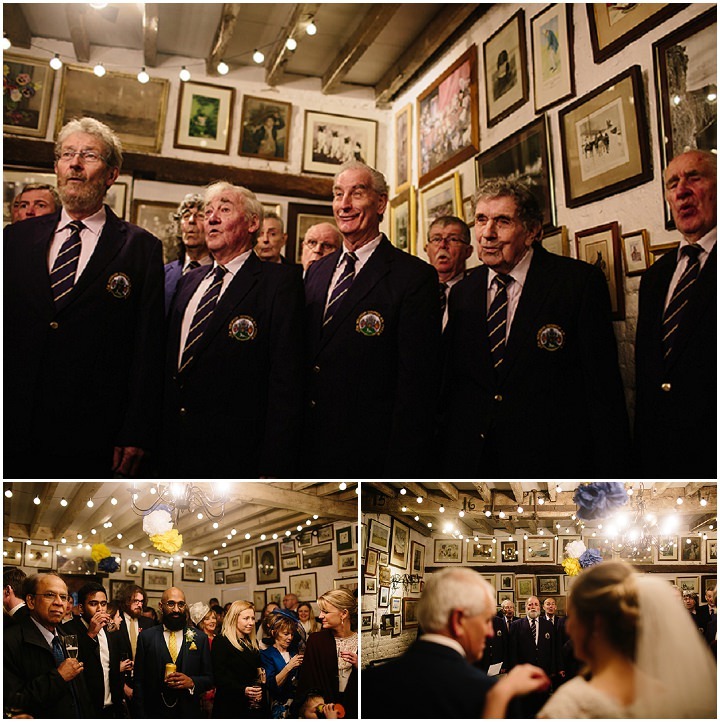 The male voice choir were a really special touch, and it was lovely to share a Welsh tradition with our wedding guests. 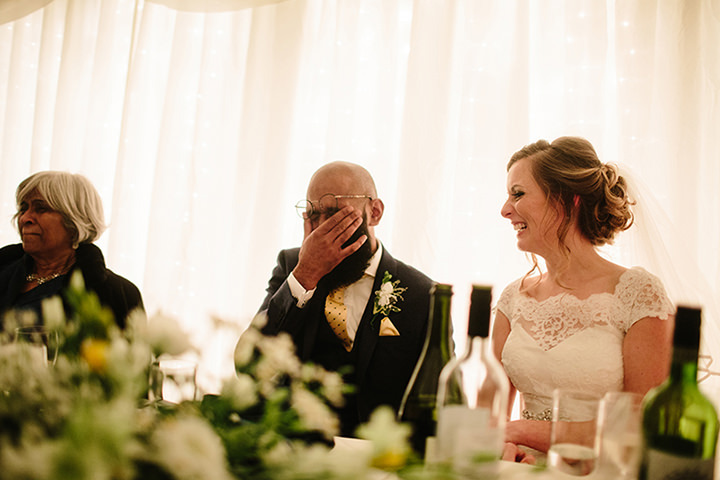 The Father of the bride’s speech was amazing. Sam’s speech, which was largely freestyled, was brilliant and caused a few tears and many laughs. The whole day a was a dream come true from start to finish; but finally walking in and seeing all our favourite people, and Sam at the end of the aisle was just incredible. It will all be OK on the day… but plan! Delegate! People like to be involved and help. Emma wrote a running order for the day to ensure nothing was forgotten and we asked different friends and family to help with different jobs. 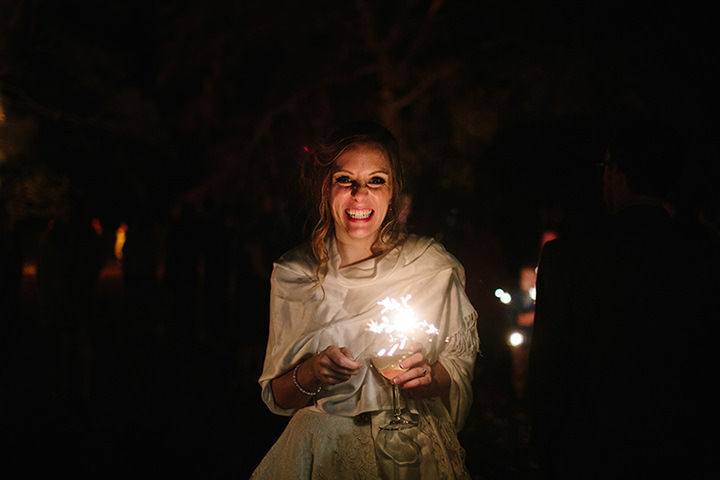 I loved that our wedding was a weekend. 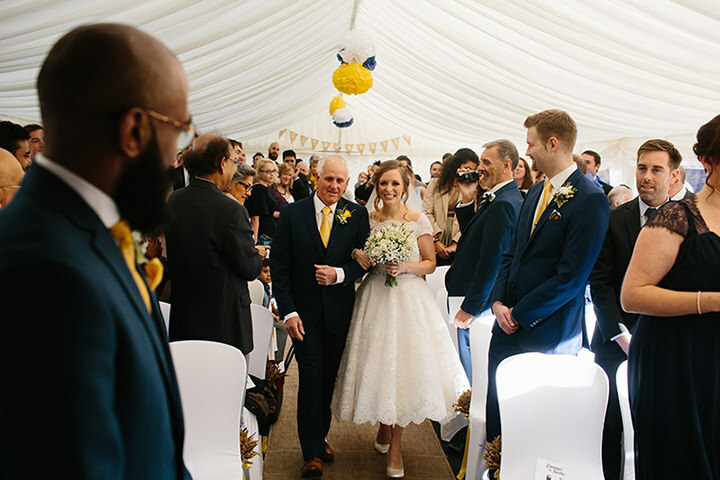 We had a meal for close family and the bridal party on the Friday night, and mum and dad opened up their house on Sunday for folks to pop up – and honestly, the day went SO quickly, and people had travelled such a long way – I was glad I got to spend quality time with them. The weather!! 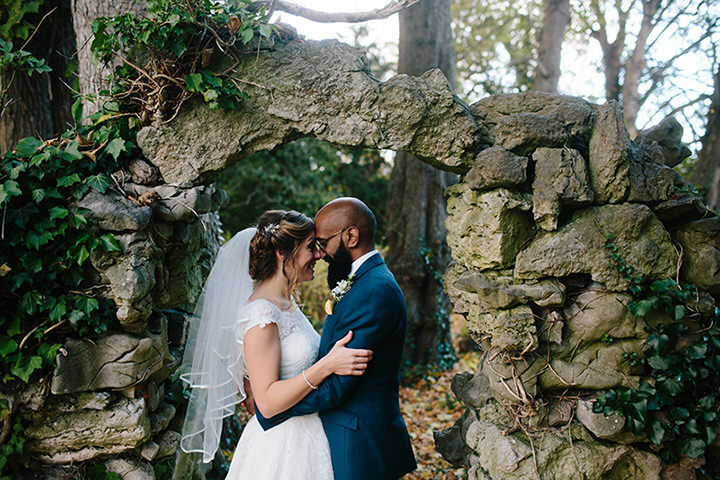 We could not have asked for a sunnier November day; crisp and Autumnal – such a fantastic surprise, and really enabled the day to run really smoothly and include all the elements we wanted. 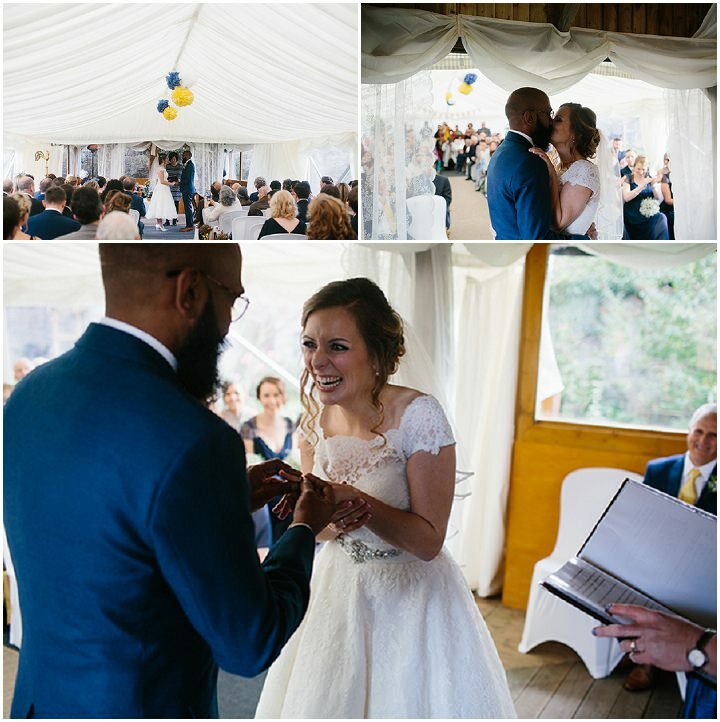 I think we were both quite surprised at how much we enjoyed the whole day – there wasn’t a moment of stress or worry – it just flowed perfectly. Wish we could do it all over again! 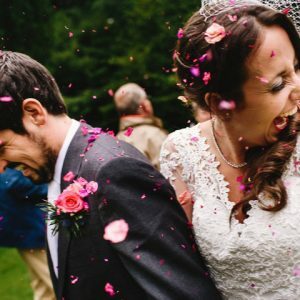 Some lovely wedding photos, there Dan. You have a lovely relaxed style.